Well, I hope you’re all enjoying the summer and all that sporting stuff that’s happening. My personal favourite is David Rudisha’s 800m world record. Now that’s beautiful running. We’ll be back with you for our first autumn meeting on Thursday September 20th – watch this space. In the meantime, existing license holders for any version of Creative Suite from CS3 upwards can subscribe to Creative Cloud for £27.45 per month (VAT inclusive with a one year contract). For those of us who already have a boxed version of the software, don’t forget Cloud offers some things you don’t get in the desktop version: Muse, Edge, Catalyst, Typekit, Lightroom 4 (new), and the additional Touch Apps, plus online sync and storage. If you’ve attended a User Group meeting in Oxford, contact us to get your discount code. Adobe MAX 2008 Europe – Take the chance and register until November 14th and Save EUR€240! This year’s MAX offers you more opportunities to connect with forward-thinking developers and industry leaders than ever before. Be part of the future of development. Join us—and as a member of my User group, you’ll save EUR€240 when you register before November 14, 2008! 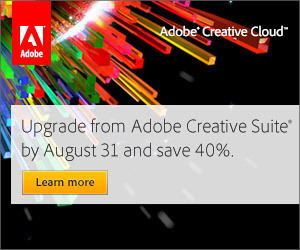 * Offer good for new Adobe MAX 2008 registrations only. Offer good for Adobe MAX Europe full event pass registration only. The offer applies to an Adobe MAX full event pass only (EUR€840). Offer cannot be combined with any other offer, package or registration code. Offer expires 11:59 pm PDT November 14, 2008. Terms and conditions for Adobe MAX registrations will also apply. Void where prohibited.